Well the local guy was out chowing down again. On this day I was in the mood for a sandwich, a hot sandwich. I was craving a roast beef sandwich. And there is only one place to go in town for a authentic roast beef sandwich. Yes I am talking about the almost world famous Beefy King. This institution has been around since 1968. Its one of the oldest restaurant establishments in Orlando. Three generations have operated the family-owned establishment starting with the Smith’s who passed the store onto son Roland and his wife Sandee whom after operating the store for 30+ years have turned the day-to-day operation over to their daughter Shannon and husband James Woodrow. I just love stories like this. When I go to Beefy King. I usually only order one thing. Yes you guessed it, the roast beef sandwich. Folks, this is not an ordinary roast beef sandwich in my humble opinion. When this sandwich is made, its made with true love. After the roast beef is cooked and sliced its kept warm until the order is made. After you place your order, the sandwich maker “steams” the meat on the steam vents which are located on the surface of their counter. The steaming process is the key that perfects this sandwich. It comes on a Kaiser Roll which is also steamed to perfection. I always have cheese on mine. It comes plain unless you opt for the extras like cheese, lettuce, tomato, onion. Trust me, stick to having it plain or add cheese like I do. I always get the regular meal deal. The meal deal comes with spuds and a drink. The spuds are tater tots. The tater tots really compliment this sandwich. They are always crisp, and fried just right. Just the way I like them. When I sit my tray down in front of me is when the real magic starts. I put the house bbq sauce on the sandwich. Next I put the house horseradish sauce on the sandwich. Next I eat it and I am in roast beef heaven. Out the door my total was $7.77 for the regular meal deal. I like those numbers! I always feel like I hit the jack pot in this place! If roast beef sandwiches it not your thing they also have ham, turkey, pastrami, corned beef and bbq sandwiches. Stick with the roast beef ladies and gentlemen. Helpful hints to know- you place your order at the counter. Minutes later you pick up your own order and you carry it to your table. Next go the little sauce station and fill up your small plastic containers with your favorites sauces and bring them back to your table, then dress your sandwich at your table. This is easier then bringing your sandwich to the sauce station. Parking is never a problem. They also have a drive thru. 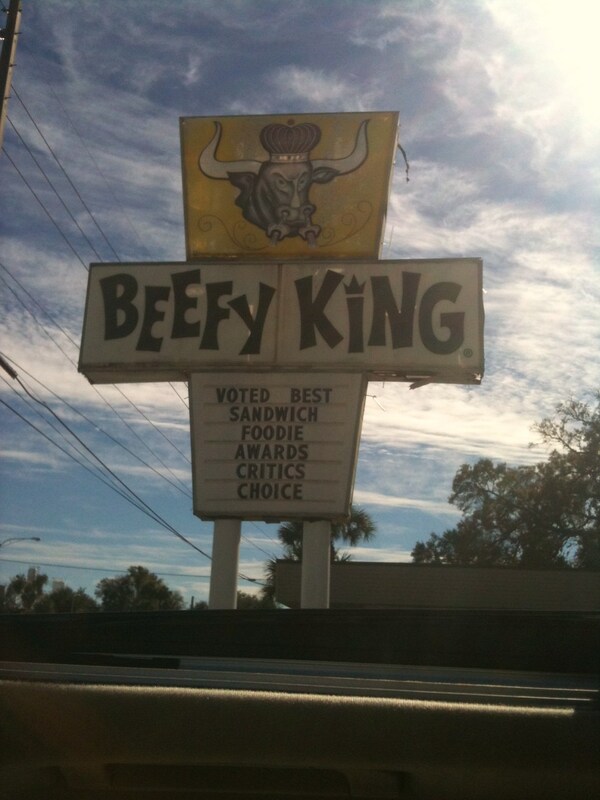 Beef King is located off of East Colonial Dr and Bumby. Beefy King is open Monday – Friday 10-3. Saturday 11-3. Sunday closed. Well it was Friday night and my wife and I were in the mood for some good Italian food. Too bad we were in an Italian food mood on this night… Will explain. We headed over to Stefano’s Italian Grille, located in the Summerport Village right outside of Windermere. Don’t get this placed confused with Stefano’s on Tuskawilla Rd, no affiliation. A couple to a few years back I recall this Stefano’s restaurant was also located in Dr. Phillips on Sandlake Rd (aka Restaurant Row) next to the Publix. Stefano’s Italian Grille did not last long at this location. I also remember the chef or owner being from Pittsburg. Then a sports bar opened up in its place and has now has closed. I remember back in the day when this location was Carrinos, an old southwest Orlando favorite. Anyway, we were greeted by a younger female server. She brought out our waters. They put a thin slice of cucumber in their waters, nice touch and creative. However, things go down from here. I ordered the Chicken Parmigiana . And like I do at other restaurants like Carrabba’s I always ask if the chef can pound the chicken extra thin for me. It’s just so much more tender this way. At Carrabba’s they don’t give you an odd look, they treat it like regular conversation and they make it nice and thin for me (try it) when you ask them. Not at Stefano’s! The server said they could not do that, it was already pre prepared. Found that very strange, they could not pound it thin for me. I can make this dish myself, and if its pre prepared or not, it can still be pounded accordingly, imagine that? Trust me, not to tricky at all. It came with pasta. I asked if I could get the Sautéed Spinach instead of the pasta, the spinach that is one of their sides on their menu (trying to eat more healthy). Again, no can do. 0-2 here. The young female server would not budge. Her stance was, it’s prepared as is or it is what it is. Again, same type of dishes is served at Carrabbas’s and you can get it this way plus you don’t get lip service, they just accommodate. I was still in the mood for Chicken Parm ($15.90) so I ordered it any way. I thought it might be surprisingly good; yes I was taking a chance. It was lightly breaded; pan seared, with marinara sauce, mozzarella, provolone and Parmigiano –reggiano cheeses. The chicken dish came out quite THICK, and not to my liking. That’s why I wanted it pounded thinner. The sauce and pasta was just OK. Entrees are served with a vegetable of the day and starch of the day. Salad with your meal is an additional price. Speaking of the salad ($4.50), it was fresh. It was served with mixed greens, with bacon, carrots, chi chi beans, cucumbers, croutons, olives and Parmigiano-Reggiano cheese, with house made balsamic vinaigrette. My wife had Pasta Arrabbiata ($13.90). It was served with Sopressata, San Marzano tomatoes, mozzarella, parmesan, and banana peppers. This pasta dish is traditionally a semi-spicy dish. However it was not spicy. No kick to it. I thought the banana peppers in this dish unbalanced this entrée. My wife thought the dish was less than OK. I did see the chef come out and talk to some of the diners. However, on this night he did not stop by our table. Stefano’s is located in a Publix shopping center. There is plenty of parking available. For what we spent on this meal, adding salads, having adult drinks, and having the server “not try” to accommodate my small “asks”, I can’t recommend this place at this time. I will give it another shot in the future. If you read my About page it says I am “open” to try different things or restaurants at times or occasions. One of these so called occasions came to fruition recently. On a recent Saturday for lunch I tried Eden’s Fresh Co. Yes, I was thinking like you are right now, what the heck is a Eden’s Fresh Co. Well, they serve fresh salads and wraps. If you are a vegetarian it works for you. If you are not a vegetarian like me, it still can work for you. This place is semi-hidden, tucked away in a small building off Fairbanks that turns into Orange Ave not far from Park Ave in the Winter Park area. When you walk in you might notice an unusual set up? They have high top tables in the front of the restaurant. In the back of the restaurant they have regular tables. They also had a nice big screen TV on for viewing in the back section of the restaurant. You order your food at the counter. A salad builder makes the fresh salads in front of you. On this day, they only had 1 guy making salads at lunch. Lucky for him people trickled in every few minutes. If everyone would have come in at the same time, it could have looked like I4 traffic at 5:30 pm in downtown Orlando. The menu has 11 salads/wraps to choose from. I had a salad, the Desperado $4.85 and I elected to add the Protein $2.00 extra, Boar’s Head smoke turkey was recommended in this salad. This Southwestern salad features Romaine, Black Bean and Corn Salsa, Tomatoes, Onions, Black Olives, Tortilla Strips and Chipotle Lime Vinaigrette. All the lettuce and toppings (tossings they call them) were very garden fresh and it tasted like a delicious salad. The Chipotle Vinaigrette was the perfect dressing for this salad. I am a meat person so I am glad I had the Smoked Turkey with my salad. The turkey went well on the Desperado. I am not the type of person that likes his salad to be the whole meal, however I was pleasantly surprised on how filling it was, but in a good healthy way. I left being comfortably full, this was a nice change and a healthy change. You are what you eat, right? On another note, if you feel you don’t like any of their 11 salads or wraps that’s on the menu you can request the salad builder to build a salad just the way you like it. They have around 37 different Tossings to choose from. You get 5 Tossings. Each additional Tossing is .40. Eden’s Fresh Co. has 12 dressings to choose from. They also have several Protein items to choose from like turkey, chicken and even tofu. Due to the size of the plaza parking lot, it can be limited and tight. Eden’s Fresh Co must be doing something right; they also opened another location in downtown Orlando. So grab your vegetarian friends or non vegetarian friends or a mixture of both and head over to Eden’s Fresh Co. The local guy (me) was out eating once again in the Orlando market place. I was in the mood for a good hot tasty seasoned sandwich. I was also looking for a place that had atmosphere and the option to dine outside. Live entertainment would also be a plus. Is there a place like this in Orlando? Well, I am happy to report there is. Press 101 sandwich & wine bar is that place. They are located in the Dr. Phillips Marketplace area in SW Orlando, right off of Sand lake Rd. First off, they do have outside seating. If it’s cold out they have the heat lamps to keep the dining experience enjoyable. On Thru-Sat they normally have live entertainment. Another plus, of course, you don’t pay a cover. About Press 101, this place is known for their Pressed Sandwiches. I opted for the French dip ($10.5). My wife opted for the Turkey and Brie ($9). My French dip pressed sandwich consisted of slow roasted prime rib, served on a warm baguette with provolone cheese, home made au jus and horseradish sauce that had the right spiciness or kick to it. I loved having both sauces to choose from. I even opted for the spicy flavorful jardinière for $1 more. The added jardinière side really kicked it up a notch, basically you just spread it on or inside the sandwich. Wow, what a kick! The meat, the cheese, the bread, the sauces all flowed so well together. The sandwich also came with a side salad on the dish. It was just ok. I wish it was on a different plate but it did not take away from the well prepared French Dip. I guess I am old school but I just like my salads separate, totally separate on its own plate. My wife ordered the Turkey and Brie. It came with smoked turkey, granny smith apples, and brie cheese and honey mustard on a ciabatta bread. Of course with the salad on the plate. She loved her Turkey and Brie. The flavors flowed nicely with turkey, fruit and cheese. Sounds a little odd in my opinion but it’s actually quite good, I tried it and loved it. On another visit I tried the Havana ($8.5). It comes with marinated pork, ham, swiss, pickle, dijonaise on a baguette. It was not like the Cuban sandwich I had recently in Little Havana in Miami, but it was good! Very tasty! I really did like how Press 101 serves this one up. We also tried the Grilled Cheese ($8.5). It comes with Gruyere, fontina and sharp cheddar, apple wood bacon, and ripe tomatoes on wheat bread. This is by far the best grilled cheese sandwich in Orlando in my opinion. It does not get better than this. I was in grilled cheese heaven awhile eating this wonderful sandwich. Press 101 has also a nice comfortable bar. Beer and wine only is served. I like the TVs at the bar as well, nice way to catch up on scores and other things awhile dining there or just sitting at the bar itself is also pleasant. Plenty of parking is always available, parking is free. Press 101 does a great job with sandwiches overall. I just can’t wait for them to add some more menu items. I give Press 101 a good review and recommend this fine dining establishment. I am now writing my second review or post. This review is going to be about one of the most popular dishes world wide we all enjoy to eat. Yes, I am talking about pizza!! We usually have “pizza nite” at least 1-2x a month. I have eaten at many pizza places in Orlando. I must say we don’t have very good quality here in our fine city. However, we do have fine few decent pizza places that make a good pie. I am just spoiled. 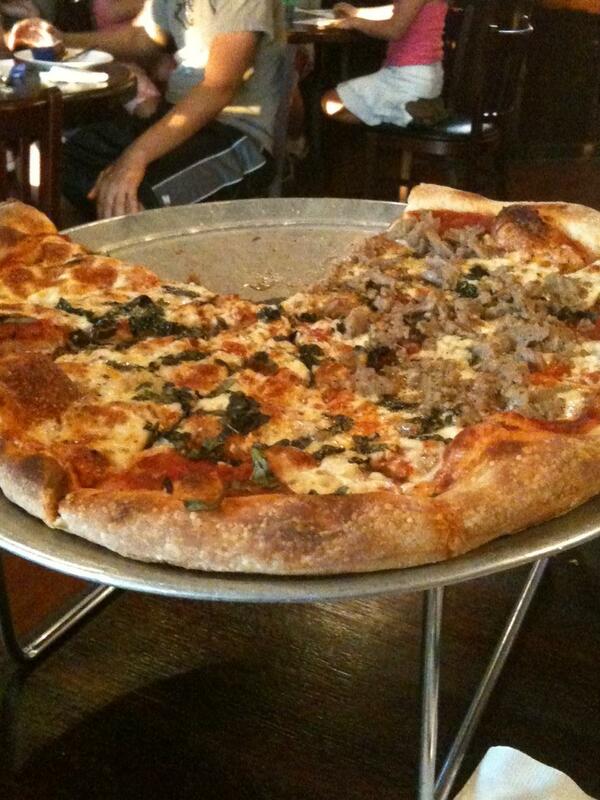 I have had pizza in New Haven, CT numerous of times. It’s to die for. New Haven has the best pizza on planet earth in my opinion. Pepe’s, Sally’s, Modern Apizza, and even Bar are great. Some of these places were there when my dad was growing up and they are still there to this day. These places are institutions. If you are ever in the New Haven area, try them, you will not be disappointed. However, back to the Orlando scene regarding pizza. 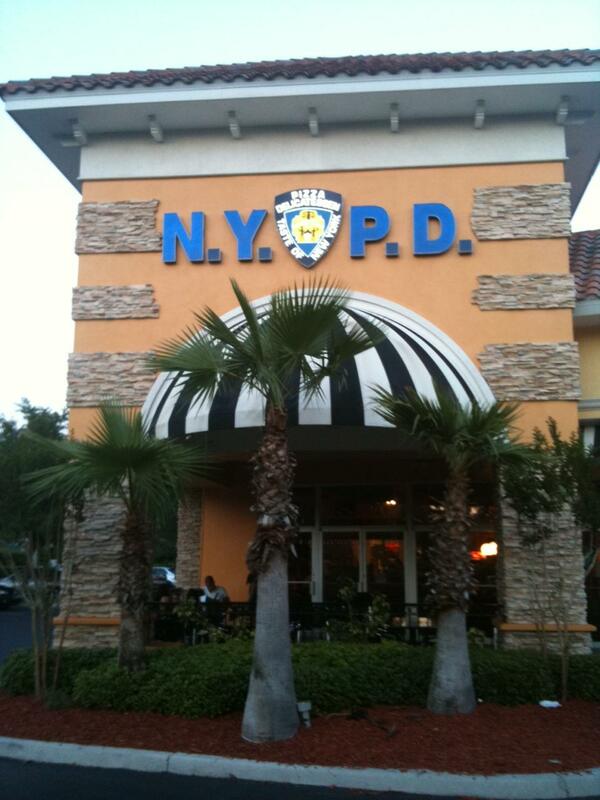 Our latest visit was to NYPD Pizza in Metro West. We ordered a Margherita style pizza. It had sauce, cheese, basil, garlic, etc. Noting wrong with a basic style pizza once in a while. We specially ordered it to be thin and crispy, and slightly well done. NYPD Pizza delivered on all accounts. It was thin and crispy and done just like we like it. It was perfectly thin. It was flavorful. It even seemed like a lite pizza if there is such a thing? It definitely was not heavy or thick, but just to our liking. You could taste the minced garlic and mozzarella cheese in its flavorful italian style sauce. Yum! You also can’t beat the beer special. 5 ice cold beers in a very cold bucket for $6 bucks, what a deal. We love ice cold beer with pizza; they really do go hand in hand in my opinion. Pizza and beer is a match made in heaven. NYPD has a variety of pizzas, wings, salads on its menu. It has TVs for viewing, but they need to invest in larger TVs in my opinion. But most people don’t go to watch TV they go for their tasty pizza. The service was attentive, friendly, and caring. Parking was easy and plenty of it. Prices- $ reasonably priced. Well it’s not pizza from New Haven but its very good pizza in Orlando. My bottom-line review, NYPD Pizza in Metro West gets a “Good” review. Go check it out!